Sometimes I need a break from all the pink-fairy-cupcake-unicorn books my two princesses command me to read at home. So my inner tomboy was delighted when I won a collection of "boy books" from Peachtree Publishers. The reads also showed me I love middle grade boy books (which probably doesn't surprise anyone, knowing my penchant for potty humor, pirate speak, and torturing bugs. 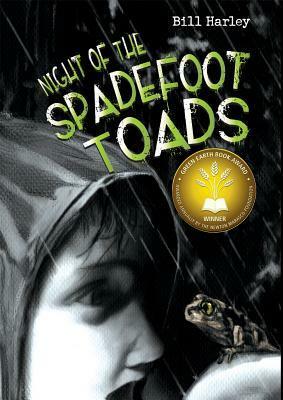 I admit to reading Night of the Spadefoot Toads (by Bill Harley, 2008) first, because the cover made me think it was about an attack of zombie toads (which would be awesome!) It turned out to be a great environmental story where the scary things were moving to a new town and the threat of losing a vernal pool where endangered toads were breeding. I have started work on a middle grade story (and by "started work" I mean I have a character, a situation, and a lot of sheets of blank white paper). Spadefoot Toads with a simple story line and a short span of time (4 months) makes for a great book to study plot. I graphed the plot across the book's 218 pages (about 40,000 words). Chapter 1: The first three sentences introduce the Main Character, Key Supporting Character (his teacher/neighbor) and the Nemesis. The first page provides the setting and the MC's challenge of starting at a new school. The Buddy is introduced on page 3. The MC makes his first mistake by page 5 which creates the relationship dynamics for the rest of the story. Bam! All that in the first chapter. Chapters 2 & 3: We learn about the MC's main problem, and the MC is confronted with an obstacle. He has a couple small wins. Chapters 4-10: MC has a small step forward and a small step back (more obstacles) in each chapter which shows us his personality and demonstrates how his relationships are developing with the other characters. The foundation is laid for the main conflict. Chap 11-15: Learn details of his teacher's problem and takes his first action to solving the problem. Chap 16: BANG, BANG, BANG - Bad things are piling up. He reaches his lowest low, but then is given a second chance. Chap 17: Peak: Momentum is in the MC's favor and good things start to happen. He makes his final attempt at solving the problem. Chap 18: Resolution! I'm not going to include spoilers here, but let's just say it's a happy ending. So that's how it's done! Easy enough. Now why do these white pages seem so darn intimidating?! Do you have any great plot resources to share? Post them in the comments, please! I am impressed, Lauri! That is a great graph and it is an excellent way to study MGs. I wish you well in this genre. I know you will make it! Those first 5 pages are important and it sounds like Harley has the formula down. We have the character's dilemma by page one and the first major plot point by page 5. I love seeing plot outlines of books. This was great, Lauri. My favorite books on Plot are James Scott Bell's "Plot & Structure" and Donald Maass's "Writing the Breakout Novel." Best of luck on your MG novel. You can do it!! Stuffing everything in the first page always seems like a challenge, but bam! writers successfully do it over and over again. Thanks for the recommendations and encouragement! Lauri, Thanks for sharing your plot graph. Something good to think about. I agree with Erin - I'm in the middle of Plot and Structure and love it. Next, Maass's book. Good luck to you! Oooh --just saw this post on Kathy Teaman's site and thought of you and Mike: my picture book blogging buddies! I love how, if you stretched that plot line out straight it would show the Climax is not in the middle of the story. I teach third grade and they are starting to grasp the concept if a plot line diagram, versus the idea of teaching beginning, middle & end. We have focused on picture books, but I want to do a chapter book. I look forward to reading this book and investing thst for my kids. Thank you!!! !